Lonavla - A Monsoon Getaway Worth Remembering! Very often, people keep gnawing, working and follow the same routine in their day-to-day life. Sometimes, they feel boredom and want to come out of it. They desire to take a break and idea of heading to a new place excites them. Do you also follow the same lifestyle and spend most of the time in the office only? Does again and again your mind hints, “It’s that time of the year, when you deserve a nice vacation”? If yes, then, how it would looks like when you head to the vacation trip with your colleagues. Isn’t it exciting? Hosting vacation trip for the company staff is the coolest perk that company can offer to its employees. Our company Credencys Solution, IT firm also organizes such trips annually at exotic locations to delight the employees. 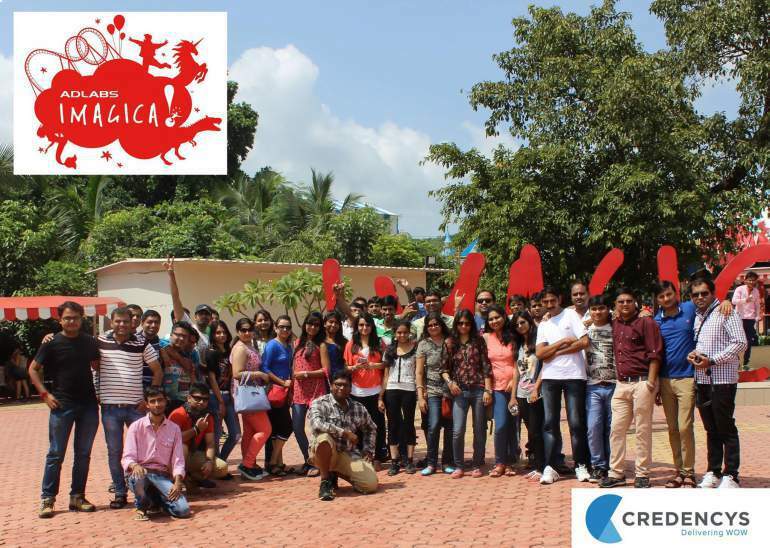 Last year, company organized Goa trip specifically for the Credencys staff for three days to let them relish, have fun and a great time. After a long wait of one year, finally staff is again take off to the worth visiting site Lonavla. After a long 12 hours of journey by train, the staff is landed on beautiful landscaped Lonavla for 4 days and 3 nights trip. In these couple of days, they garnered an immersive experience of sight seen, DJ party, waterfalls, caves, trekking and many more. Apart from these, there is also an award ceremony organized for the best performers of the year. Let’s view the brief of this spectacular journey which is full of endless memories. Overnight journey of train made the staff tired and restless, so after check-in the five star Fariyas resort, they relaxed for the whole day. They head to the Lonavla to experience the adorable scenic beauty of seemingly wonderful places like Bhushi dam, Khandala ghat, and Lion point. Also, trekking was the adventurous part of the trip. After returning back to the hotel, it is not all over as awesome DJ party is waiting for them. In the mid of thrilling party, award ceremony was the big surprise for all that perplexed everyone where the top performers of the company were awarded category- wise for their outstanding performance. Everyone was bone-tired after the stunning events of the 2nd day, so they took rest for some time and thereafter move to the water park. In the water park, they had fun filled experience with numerous exhilarating rides, swirling slides and Sunken bar. Handful of employees also visited Bhaja caves, Logarh fort and Carla caves. Last but not least, the fourth day of the trip gave them breathtaking experience of most amazing amusement park, Adlab Imagica. The park styled on Disney land theme has 21 international standard rides that cherished everyone. The trip is over, but the memories are still alive. And, again employees are eagerly waiting for the next drive to the coolest vacation at another exotic location. Count-down begins!